1. Cover cabbage leaves with boiling water. Let stand until leaves are limp. Drain. 2. Mix beef, rice, garlic, salt, pepper, onions and green pepper. 3. Put 1/3 cup in each leaf; roll, tucking in the sides. 4. Place rolled cabbages into a baking dish. I added a little bit of sauce to the bottom of the baking dish. 5. Cover rolled cabbages with Nello's Biodynamic Marinara Sauce. Add parmesan cheese if desired. 6. Cover and bake at 350* for 45 minutes. 7. Serve with a delicious salad or bread and enjoy! 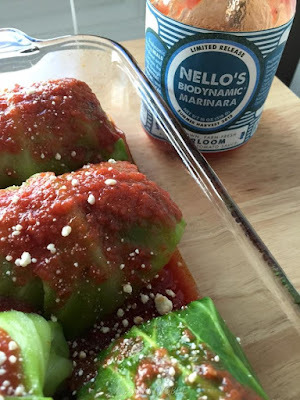 Nello's Biodynamic Marinara Sauce is delicious! It's like nothing I've ever tasted before. This sauce is all natural an does not contain any yucky ingredients. All of the ingredients are from the U.S. Nello's Biodynamic Marinara is the perfect sauce for every meal. Use it on chicken, pork, steak, fish and of course pasta. 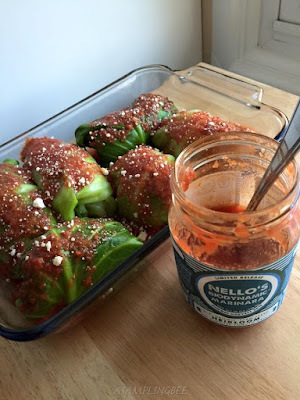 Nello has sure made history with this sauce! I can't wait to see what Nello comes up with next! Visit Nellos website to learn more! I love my job as a mombassador for Nello's! Sauces sent to me to review and create awesome recipes! 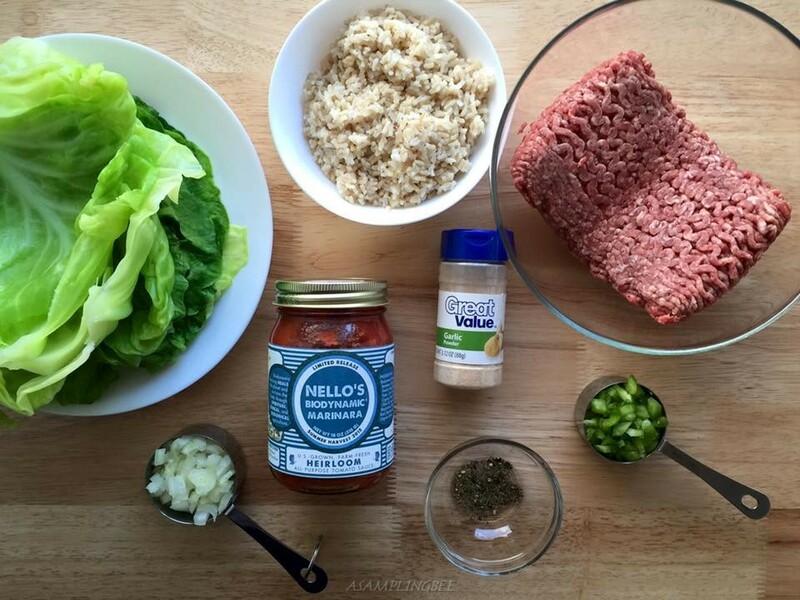 Stay tuned for a special recipe featuring the "dadbassador" in our house! Your stuff cabbage recipe will share looks yummy! I have never done stuff cabbage before. I've always heard that it's not an easy recipe to make. But this recipe looks easy enough to try. 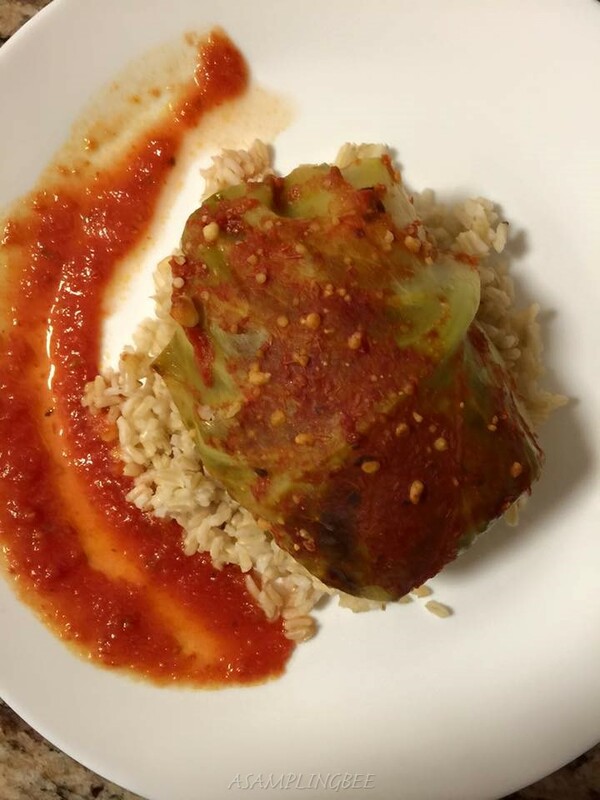 This was my first time attempting to make Stuffed Cabbage. I was surprised by how easy it was! That looks so delicious! I love cabbage stuffed recipes. Thanks for sharing this one. This looks so good! I really want to try this recipe. I have never tried any kind of cabbage rolls like this. Thanks for the recipe, in my family we have this rarely but with a good recipe we'll have it more often. I have never tried to make my own stuffed cabbage but this seems easy enough. It is def. something my whole family enjoys so it will be worthwhile to give it a try! Thanks for sharing this! I haven't tried stuff cabbage so I think I might try this one out. Give it a try! So yummy! Yummy! I've always wanted to use cabbage as a wrap! Great idea! This looks really yummy! Something perfect for family night in! 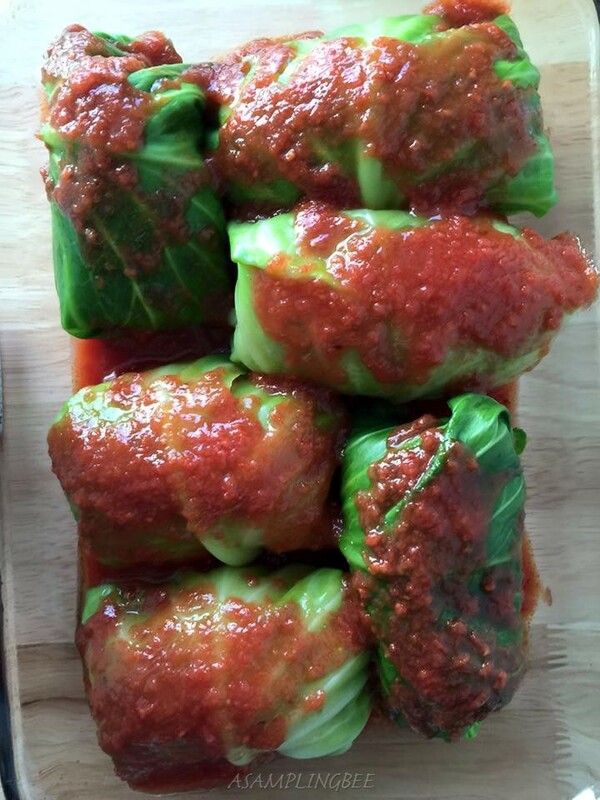 We absolutely love cabbage rolls. I can't wait to try your recipe. Honestly, I can not wait to try out your recipe. Looks so easy to make which is perfect for me. 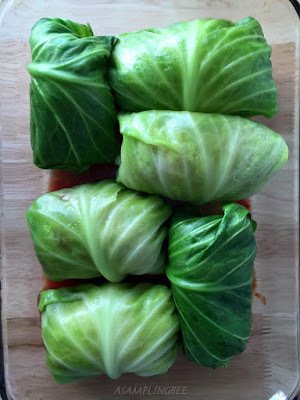 I have never tried stuffed cabbage before, but this looks really good. I can't wait to try it! I've had these but I've never tried to make them. They look delicious! 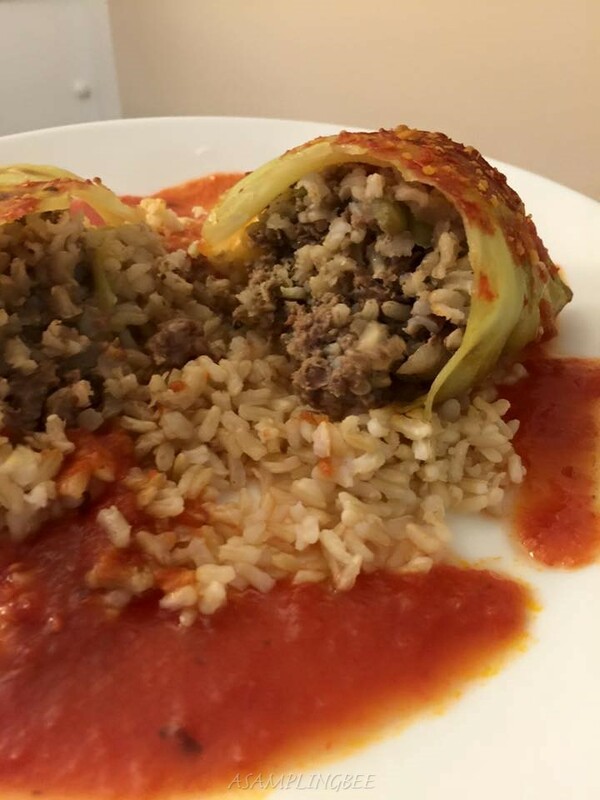 I like stuffed cabbage, but my husband doesn't. This looks delicious. Really a different idea with cabbage. I never tried this kind of stuffed cabbage before. My kids hate to eat cabbage and veggies. This sounds like a great idea to convince them finally. Would love to try this delicious recipe. This stuffed cabbage recipe looks so delicious! I love these kind of dishes!